Tae Kwon Do, meaning "the way of of the foot and fist" is a Korean martial art that emphasizes using the hands and feet for self defense. Patterns and sparring are challenging and a great way to stay in shape. We teach traditional ITF patterns. Our class meets three times per week (see schedule) and includes all ages. There are no testing or belt fees. 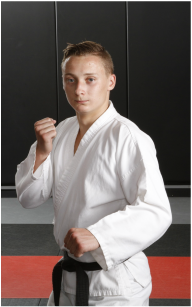 Scotlon began training in Tae Kwon Do when he was 8 years old and earned his 3rd degree black belt in 2014. Scotlon is an active competitor in Tae Kwon Do, Karate, Judo, Kendo and Jiu Jitsu. Scotlon has been teaching martial arts since 2012.